failures, weaknesses, biases, bad moods, and sins. It reinforces the truth of Scripture and gives hope for someone like myself. Jonah was a type of Christ in two ways; in the ways they were dissimilar and in the ways they were similar. 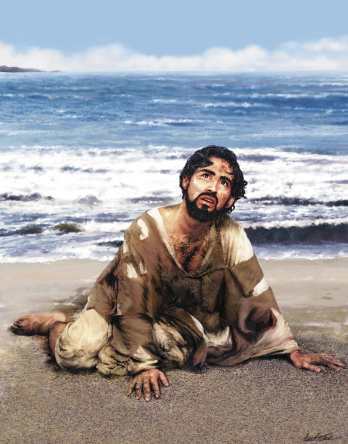 Christ was perfect, whereas Jonah was far from an exemplary character. He was a disobedient prophet who thought he could hide from God. He appears to be cowardly. That’s our first impression of him because of his reluctance to go to the Ninevites, who were a feared people and enemy of Israel. Yet, later on, we see his real reason for running. It wasn’t fear of the Ninevites. It was fear of the mercy of God on them. getting what our sins deserve. I am saved from getting what I deserve, and you, Jonah are saved from getting what you deserve as well. No one merits salvation by the works of their hands. Christ was in his tomb-prison for three days. Jonah realizes his watery grave is equivalent to being in hell. For Jonah, the worst aspect of death was separation from the presence of the Lord. For Christ, the worst aspect of the cross was the separation from His father. Jonah now longs for the presence of God that he earlier sought to escape. Jonah recognizes he is in the realm of death and only God can save him. “Yet you have brought up my life from the pit, O LORD, my God. Salvation is of the LORD.” Jonah 2: 6b, 9b. grander scale, Christ’s fulfillment of His mission, dying on the cross, being buried in the earth and resurrected resulted in the salvation of His enemies. When Jesus gives this cryptic message about the sign of Jonah to the scribes and Pharisees, he adds a condemnation. generation would not believe. Therefore, their punishment is greater. Q– Do you ever feel that someone doesn’t deserve God’s mercy, like a child molester who repents before they die? Do you resent that they get that they will be in Heaven along with you, who have served God your whole life? God forbid! Don’t be like the elder brother in the parable of the prodigal son. Rejoice whenever you see God’s mercy to sinners, because He has extended it to you, too. If you feel this way, it may be that you think we are saved by works, or condemned because of our actions. No, it is all of grace. Our good works don’t merit Heaven for us; God’s grace does. The child’s molester’s sin doesn’t exclude him, because God’s mercy reaches the vilest sinner. R– Ask God to help you to truly see both His holiness and your sin, and you’ll be amazed at His grace. If a superior attitude has kept you from witnessing to someone you feel is beyond the reach of God’s grace, repent and pray for that person. Ask God to save them. It’s hard to hate someone for whom you’re praying.